The mass shooting in Toronto's Greektown neighbourhood stunned people in a normally safe city, already unsettled by an attack just three months ago. Toronto: Investigators said Tuesday there was no national security risk following the mass shooting that killed two people and wounded 13, as they continued to probe the life of the 29-year-old gunman for clues to what prompted the deadly rampage in a popular Toronto neighbourhood. Authorities also identified the 10-year-old girl who was one of those slain as Julianna Kozis of Markham, Ontario. Toronto police released a photo of the smiling, young girl, and said her family had asked for privacy during their time of grief. Police previously identified the other person killed in the shooting as 18-year-old Reese Fallon of Toronto. The assailant, Faisal Hussain, died after an exchange of gunfire with police. His family has said he suffered from lifelong “severe mental health challenges” but they never imagined he would do such a thing. It was not immediately clear whether he took his own life or was killed by police during the attack Sunday night. The mass shooting in Toronto’s Greektown neighbourhood stunned people in a normally safe city, already unsettled by an attack just three months ago when a man used a van to plough over pedestrians on a downtown sidewalk, killing 10 people and injuring 14 in an attack apparently aimed at women. Investigators searched the low-income apartment that Hussain shared with his parents and siblings on Thorncliffe Park Drive in the eastern part of the city, and removed boxes of potential evidence overnight. An autopsy on Hussain was expected Tuesday. Where Hussain got his handgun remains unknown. Canada overhauled its gun-control laws after the country’s worst mass shooting in 1989 when gunman Marc Lepine killed 14 women and himself at Montreal’s Ecole Polytechnique college. It is now illegal to possess an unregistered handgun or any kind of rapid-fire weapon. Canada also requires training, a personal risk assessment, two references, spousal notification and criminal record checks. During a debate in City Council on Tuesday, Councilman Joe Cressy asked if Toronto could outright ban guns and was informed it would be up to the federal government to change the laws. Mayor John Tory has also questioned why anybody would need a gun in Toronto and said he supported a motion urging the federal government to ban the sale of handguns in Toronto. It passed on a 41-4 vote. “People in the city of Toronto don’t need handguns,” Tory said. Goodale earlier said Ottawa was already considering tightening handgun laws even before Sunday’s shooting. Adam Vaughan, a member of the federal Liberal government, said handguns should be banned outright in large urban centres but noted he was speaking for himself and not the minister or government. “It’s time to get rid of handguns in cities. We have 10-year-olds and 2-year-olds being shot at in this city,” said Vaughan, parliamentary secretary responsible for housing and urban affairs. But he said the rules should be different for people living in rural areas. Canadians have long taken comfort in the peacefulness of their communities and are nervous about anything that might indicate they are moving closer to their American counterparts. Still, though mass shootings are rare in Canada’s largest city, Toronto police had deployed dozens of additional officers over the weekend to deal with a recent rise in gun violence. The city has seen 23 gun homicides so far this year, compared to 16 fatal shootings in the first half of 2017. Police Chief Mark Saunders said he would not speculate on the motive for Sunday’s attack. “We do not know why this has happened yet,” he said. “It’s going to take some time.” Among those killed, was Fallon, a recent high school graduate who volunteered for Canada’s Liberal Party and was to attend McMaster University in the fall. Officials have not released the names of any of the 13 wounded. The wounded ranged in age from 17 to 59. Anthony Parise, who taught Fallon’s Grade 12 English class, remembered her as “a leader among her peers” who planned to become a nurse. “She was so excited to be accepted into the McMaster program for nursing. I know that her plan was to become a mental health nurse,” he said. Flags at Toronto City Hall as well as at Fallon’s former high school, Malvern CI, were lowered to half-staff. Not much is known yet about Kozis, the 10-year-old victim. According to videos and witness accounts, the assailant, clad all in black, was seen walking quickly down a sidewalk on Danforth Avenue, firing a handgun into shops and restaurants in Greektown, a district of expensive homes, eateries and cafes. At the corner of Danforth and Logan, where some of the shots were fired, about 50 people milled about on a small square Monday evening, talking in several languages. They expressed shock at a shooting in such a neighbourhood. 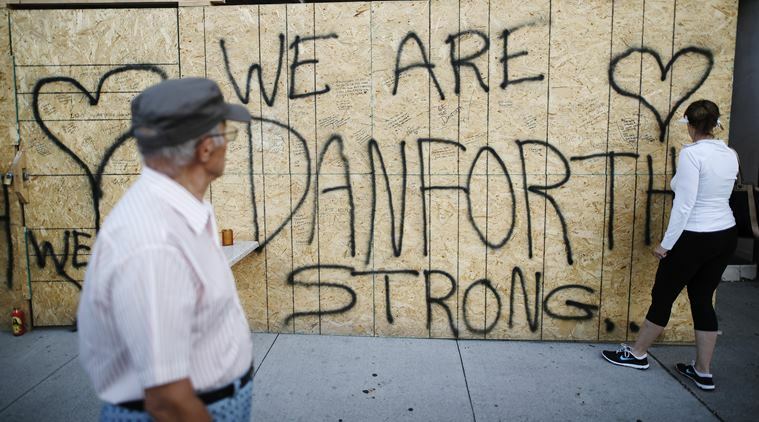 Some hugged, some wept, and many said they wondered how the attacker obtained a gun in a country with far stricter gun laws than in the neighbouring U.S. People signed a makeshift memorial reading: “We are Danforth strong.” “I’m out of my mind just thinking about it. It’s Toronto,” said Augustino Speciale, who paused to smell a bouquet of white lilies attached to a lamppost. Ontario’s police watchdog agency said there was an exchange of shots between the attacker and two officers on a side street before the gunman was found dead. Toronto has long prided itself as being one of the safest big cities in the world.